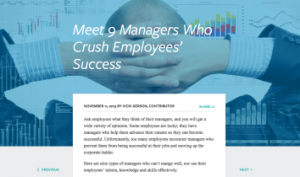 Here are nine types of managers who can’t manage well, nor use their employees’ talents, knowledge, and skills effectively. 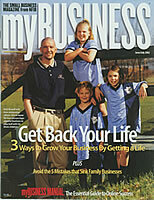 Cover StoryThis Tetra Pak management magazine cover story discusses growth and productivity – U.S. style. 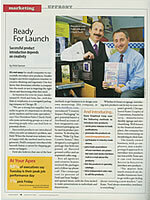 A business magazine that has a story focusing on how small businesses market new products. 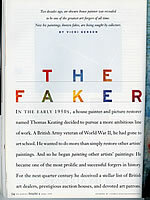 An airline magazine with a story explaining how an obscure house painter was revealed to be one of the greatest art forgers of all time. This corporate business magazine has a story highlighting how technology is automating human resources in the English countryside. A 30 page advertorial publication featuring wireless communications career opportunities. Robert Hallam, who founded a $55 million a year business building fitness centers & spas, is featured in this international publication. Vicki Gerson is a contributing freelance writer for many print and online publications. 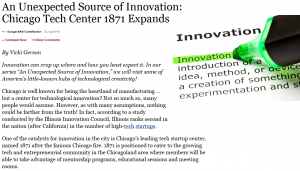 Following are links to sample articles from some of these publications. Investing in real estate used to be considered a “no brainer,” a can’t-miss investment. What Did You Say My Job Was? To view a wider selection of freelance writing samples, visit any search engine and type in “Vicki Gerson” on the search line.